Jean Sibelius’ music plays a very considerable role in the formulation of the Finnish national identity. 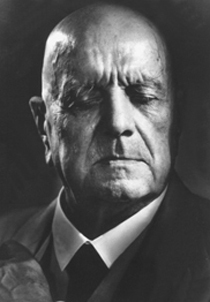 Even today, almost 60 years after his death, Sibelius is a national icon. Sibelius’ seven symphonies form the backbone of his oeuvre. As with Beethoven, through the symphonies one can observe a continuous development of a personal style. Alongside the seven symphonies, the Violin Concerto in D minor, a number of tone-poems based on the Finnish national epic the Kalevala, and the theatre music have a quite central position. How­ever, Sibelius was extremely industrious and in his production we also find an opera, chamber music, piano works, occasional compositions, 21 choral works and over a hundred solo songs. Sibelius was active as a composer until the middle of the 1920s. After that the intervals between new works grew ever longer. Most of all, it seems as if Sibelius, confronted with the new music in both the inter-war and the post-war years, lost the heart to compose. After 1926 there are only a few works from Sibelius. He presumably finished an eighth symphony which he himself however later destroyed. The Kalevala is a collection of old sagas, songs and myths from Finnish mythology assembled and retold by the Finnish philologist Elias Lönnrot (1802-1884). Lönnrot collected and published the material because he was concerned that the Russian supremacy in Finland would stamp out the native oral narrative tradition. Sibelius’ works based on the Kalevala are an extension of Lönnrot’s work. In the 1880s Finland was in the middle of a struggle for national independence. The combi­nation of myths and music, for example in the Lemminkäinen Suite or the choral symphony Kullervo, was meant to both articulate and unite the Finnish nation. The musical models were to a certain extent Beethoven and Wagner. Sibelius studied in both Vienna and Berlin and travelled frequently in the Scandinavian countries, England, Germany, France and the USA. After 1930 Sibelius did not travel abroad again, but instead assumed the role as the official representative of Finnish music in Finland. Sibelius and Mahler stand as the two most striking and highly profiled symphonists at the beginning of the twentieth century. While Mahler to a great extent exploited sudden ideas and contrasting thematic material, Sibelius let his thematic and motivic material change slowly and gradually. Assessments of Sibelius’ music have varied greatly with time. The post-war avant-garde looked down at Sibelius, while a number of Nordic composers, for example – perhaps most strikingly the Danish Per Nørgård – were able to look beyond the fashionable aesthetic currents of the day, and acknowledged Sibelius as the profoundly original symphonist he is.